Originally published under the title "Nato Needs to Reform into a Global Alliance against Islamic Terrorism – or Become Obsolete." 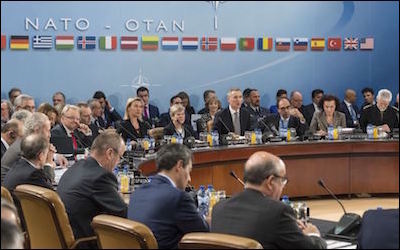 NATO defense ministers meeting in Brussels, October 27, 2016. President Trump has said repeatedly that NATO is obsolete. And he is right. For five decades NATO was necessary to, as its first Secretary General said at the time, "keep the Soviets out, the Americans in, and the Germans down." The Atlantic alliance was indeed instrumental in deterring the USSR and keeping the European continent in peace. There were many discussions as to how to achieve its goals, including major disagreements, but with America providing leadership, taking a big portion of the economic burden, and being willing to station hundreds of thousands of GIs in Europe, the allies were able to overcome all problems and stay highly successful during the Cold War. The collapse of the Soviet Union left NATO with both the sweet feeling of having won the Cold War without a real fight and the sour feeling about what should come next. In the early 90s there were voices calling for the dismantling of NATO as well as voices arguing in favor of retaining it as a safety net, just in case things went once again in the wrong strategic direction. In any case, the civil war in the former Yugoslavia offered NATO defenders a new option: to move from a territorial defense of the members in case of a Soviet invasion to a multinational body able to act on its periphery to enforce peace among rivals and contenders. More than a mission, peace enforcement was adopted as a salvation philosophy to keep NATO alive and well. Thus, in 1995 allied forces bombed Serbian forces to force the Dayton agreement and put an end to the war over Bosnia-Herzegovina. In 1999 they mounted a bombing campaign to guarantee the independence of Kosovo, a territory controlled by Serbia. That campaign lasted for 81 days, far longer than expected, and was full of questionable tactics, generating intense debates about its conduct and efficiency. There is no clear consensus in NATO on how to use military force in combating terrorism. After the dramatic attacks of 9/11, NATO activated, for the first time in its history, Article 5, the clause that determines an attack against one member is an attack against all. Unfortunately, there were no capabilities to really help the US in such a far place from Europe as Afghanistan. Actually there was no clear consensus on how to act with military forces to combat international terrorism. NATO was profoundly divided concerning the intervention in Iraq in 2003, and was only able to agree, once the combat phase of the invasion was over, on a training mission that proved to be marginal in its achievements. Later, in Afghanistan, NATO finally got involved in a stabilising mission which was very restrictive in its use of force. On March 2011, NATO started a new military air operation in Libya in order to avoid a potential massacre by Gaddafi's forces. The operation lasted until October and, as we know, evolved from a purely humanitarian intervention into a regime change campaign, ending Gaddafi's rule but leaving the country in a state of chaos till this day. The bombing campaign in any case proved politically divisive, since only a few members took an active role, and can be considered a strategic disaster by its consequences. NATO must be revamped entirely, from its strategic concept to its membership. So it can be said that NATO from 1989 to today has basically opted out of the major strategic issue of our time, Islamic terrorism, and generated mixed results at best in its out-of-area operations without becoming more efficient in its traditional mission to keep peace in Europe. Indeed, NATO has proved to be less powerful as a collective entity than some of its individual members. It is time to change that. Relying on the success of the Cold War past is not enough. The Atlantic alliance needs to be revamped and reformed entirely, from its strategic concept to its membership. The alternative is an accelerated obsolescence. In 2005 we proposed, in a study called "NATO: An Alliance for Freedom," a few ideas on how to close the gap between the NATO we have and the NATO we need. Some of them are still relevant. For instance, forget all the bureaucratic jargon about "capabilities-based alliance," "stability operations," or "operations other than war." NATO must make the fight against Islamic terrorism its core mission. NATO should accept that we are all under attack by Islamist extremist forces of all kinds. President Hollande said that France was at war, and the rest of the allies cannot sit idle by his side. NATO must make the fight against Islamic terrorism its core mission. Second, we are clearly not in a time to expand freedom in the world – a point British Prime Minister Theresa May made in Washington last week. On the contrary, we need to defend and preserve freedom in our lands. In order to reinforce our Western world, NATO must extend membership to countries that are alike in the defense of our values and with the willingness to share the burden in this civilizational struggle. NATO should invite without delay Israel, Japan, Singapore and India to become members. Defense expenditures should be revised and increased, but ceilings and burden sharing are not the problem. We don't expend more because current leaders do not feel compelled to do so. Furthermore, to spend more on the same will not change our ability to confront the threats and challenges we face. There is a myriad of things that can be done to put NATO back on track. Interior ministers should join defense ministers at council level and in summits. That's easy. But above all, what NATO needs is a vision and an impulse to transform from the new US President and administration. Yes, Mr. President, we agree with you that NATO has become obsolete. But we believe you can make it relevant again. Your allies will follow. Rafael Bardaji, a fellow at the Middle East Forum, is the executive director of the Friends of Israel Initiative and former national security adviser to the Spanish government. Colonel Richard Kemp is the former commander of British forces in Afghanistan.